History Painters deal with the narrative of historical events from classical and military history, Christian history and mythology, as well as religious and literary subjects. History Painting was a very important genre in the past. The term "history painting" derives from the Italian word "istoria". It was the dominant form of academic painting in the 19th century; ranked number 1 in the hierarchy of the genres by European academies of fine art. 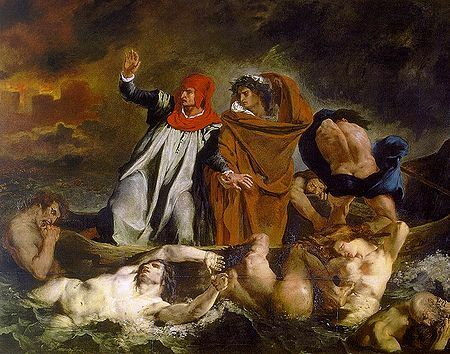 Dante and Virgil in Hell by Eugene Delacroix (1822). Some famous history painters include: Michelangelo, Titian, Caravaggio, Peter Paul Rubens, Claude Lorrain, Hyacinthe Rigaud, Giovanni Battista Tiepolo, Francisco de Goya, Jacques-Louis David, William Turner, Eugene Delacroix, Sir Lawrence Alma Tadema and Benjamin Constant. Some famous American history painters: Gilbert Stuart, John Trumbull, Thomas Sully, John Singleton Copley, Emmanuel Leutze, Edward Savage and Benjamin West. Washington Crossing the Delaware by Emmanuel Leutze, 1850. Giovanni Battista Tiepolo, Apotheosis of Spain in Royal Palace of Madrid. The Top 10 Best "History" Painters. This page was last modified on 12 April 2014, at 22:15.